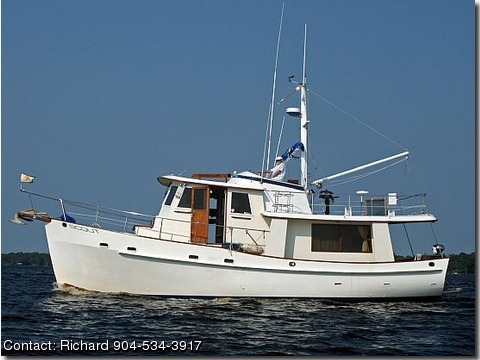 Please contact the owners @ 904-534-3917 or bullbay(dot)pier(at)gmail(dot)com.This Kadey Krogen has been completely restored to its original condition. The Kadey Krogen 42 is one of the few trawler-style cruising yachts built on a full displacement hull. As such, she is a highly regarded long-range passagemaker offering a comfortable ride and excellent seaworthiness. She is a particularly salty-looking vessel with a distinctive profile and an upright bow. A valuable feature is the functional pilothouse with watch berth located a few steps up from the salon level.